Well, let me share a secret with you all. My childhood dream was to become an astronaut. I always dreamt of being an explorer on a distant planet and may be reuttering the words – “One small step for a man, one giant leap for the mankind” and imagining to look back at the earth rising from the horizon same as what Neal Armstrong has seen. I also imagined an earth without life with people leaving in large spaceships planning to spend generations inside them in search of new home. And very few of you might know that I even penned a sci-fi story with these events.I also imagined myself getting “selected” to be members of one of those ships I named “Lau” (Hindi for a small peck of light. Symbol for hope in a dark). But I always knew that my this wish of looking at nature’s spectacular creations with my own eyes will never get fulfilled. I remember when Prof Jayant Narlikar who also is my idol, visited IIT KGP campus to give a lecture on extra terrestrial life, and I went to Netaji Audi 1 hour before the scheduled start…and it all paid off as he was also there alone uploading and checking his presentation and gave me a surprised smile. I also remember when he described the four ways to detect exo-planets (planets to other suns) and told us about the Kepler mission which will directly look at these exo-planets. One, discovery of a terrestrial exo-planet and two, announcement of launch date of Kepler. And it was again a nostalgic feeling of childhood the feeling of The “other” planet. And I felt a tinge of sadness for not being able to follow my dreams but to follow the society and fighting to get a stupid Masters degree in common sense called MBA. Anyways, the Kepler mission website also contained an interesting proposition – register to send your name along with the Kepler spacecraft. I registered for it and received this certificate. I know my name will be just among the millions and it will have not be of any practical significance but it gives me an enormous joy which I hope you can relate to – a joy in knowing that the craft which will show us the first terrestrial planet and may even detect life will have my name somewhere with it. 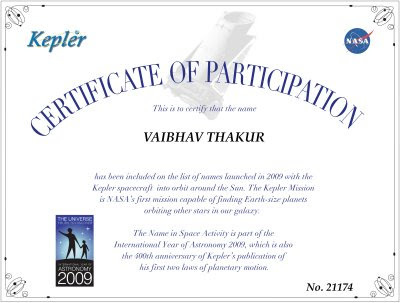 Kepler may represent first rendezvous of mankind with earth like planet and I will be a part of it. Yes, Kepler is the “Lau” of my story. Still remember the few nights we spent star-gazing. It would be great with all that laptop thing and clear night sky.